Fantastisk 3 soverom / 2 bad leilighet ligger på det ettertraktede luksus feriestedet El Campanario, bare fem minutter fra Puerto Banús. Inkludert 3 terrasser som fører til de vakre tropiske anlagte hagene, 3 svømmebassenger og barnebasseng. Egen Country Club med restaurant og bar. Innen gangavstand til restauranter, barer, supermarkeder og strand Fullt utstyrt og innredet til høyeste standard. 1 dobbelt soverom med eget bad tilstøtende en privat terrasse. 2 doble soverom, familie bad og separat gjestetoalett. Fleksibel stue med 3 riktige 'leir' senger, slik at du kan sove 8-9. Avslappet uteservering, på den viktigste overbygde terrassen med utsikt over de omkringliggende prisbelønte tropiske hager og fjell. Stor stue / spisestue, fullt utstyrt kjøkken og bruksområde. A / C, SKY, DVD. El Campanario: El Campanario ("The Bell Tower") er et luksuriøst feriested som ligger et steinkast unna den berømte Puerto Banus. Det er en oase av ro med tropiske hager, bassenger, bekker og fossefall og ligger nær alle fasiliteter samt de fineste strendene på Costa del Sol. Våre bad er til høyeste standard med dobbel vask, god plass og gulvvarme. Det er et klubbhus som du kan delta under oppholdet som har golf, tennis, gym, innendørs og utendørs svømmebasseng, spa, biljard etc. Hvis du velger ikke å delta kan du fortsatt spise det og bli med i de mange underholdningskvelder de vert. Beautiful clean apartment with all that you could need! We stayed at El Campanario from 6th August to 13th August 2017. Apartment was perfect for 6 of us, with plenty of room not to feel squashed in. Karen was brilliant answering any questions we had. The complex itself is pretty and well kept by gardeners. Pool area was very nice (apart from a lack of sunbeds) we noticed people putting towels on the beds but not using them for the whole day several times. The club house is very nice with light entertainment. Would recommend a hire car to get about although taxi service was prompt. Would stay here again! Thank you for your review and kind words. There are some guidelines for guests not to leave towels on the sunbeds and disappear so I am sorry this happened. I will be asking the community to buy additional sunbeds for the peak period and if this is something not budgeted for this year I will have some sunbeds available in my apartment to be taken down to the pool as needed by my guests. Thank you again. Lovely apartment! Location is good - but a long walk to shops and supermarket! The owner is fantastic and gets back to you straight away which is what you want! Apartment immaculate and great size - the only bad thing I can say about the apartment is there are no where near enough sun loungers around the pools for the amount of people using them! Approx 12 per pool! People having to sit on the grass! If you pay top money - this shouldn't happen! I booked this apartment for my hen do, there were 10 of us and there was plenty of room. The rooms are bigger than they look in the photos. The location was beautiful, really peaceful and quiet and only a 10 minute taxi ride to Puerto Banus for nights out. The pools were lovely, and luckily we had one to ourselves for most of the weekend! I would definitely come back again, it would be a lovely family holiday. Karen was really helpful, especially with organising extra beds when a couple of friends booked on last minute. Can't recommend highly enough! 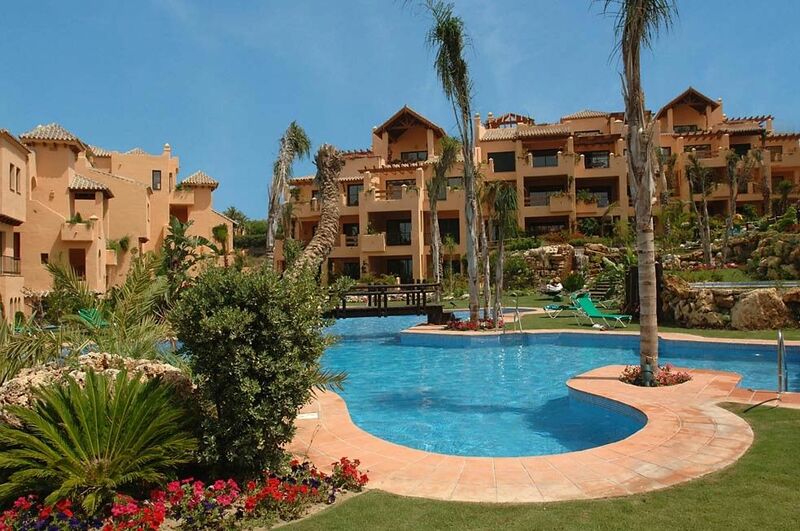 This is a lovely property based just outside of Marbella in Estapona, ideally located for what we wanted a group of 6 mums looking for a quiet weekend away with a little bit of Marbs thrown in.. The apartment is lovely, spacious, ideally located and very secure. The pools were fab and there is a beach close by with a lovely beach front restaurant. The clubhouse on site serves great food and the staff are lovely. It is 10 minutes by taxi from Puerto Banus which was fab for our Saturday night out! Close to shops and local restaurants it really does have everything you need. My friends and I would highly recommend this property.. Thank you for your kind review. I am so glad you had a good holiday. Just returned from two weeks in the apartment feeling renewed and refreshed. It was extremely spacious and it was wonderful for all seven of us to be able to eat together on the terrace. We could not fault the facilities, the pool was great and the sky subscription on the tv was an added bonus. The wifi was appreciated by the teenagers. A day trip to Gibraltar was definitely worth it, although I would 100% suggest hiring a car for the holiday. Would definitely recommend this to all friends and relatives! Thank you for your review. So glad you had a good time! Karen est sympathique et réactive. Très grand appartement avec une belle piscine. Il manque juste plus de vaisselle et un étendoir ! Vår leilighet ligger bare fem minutters kjøring fra Puerto Banús, og bare noen få kilometer fra Marbella, San Pedro og Estepona. El Campanario ligger mellom kysten og fjellene, har vakre hageanlegg med tre bassenger og 3 bassenger for barn. Det er klubbhuset på stedet som serverer god mat og drikke i fantastiske omgivelser. Noen av de beste golfbanene på kysten er en kort kjøretur unna, og stranden er bare en fem minutters kjøretur unna (15 minutters gange). Det finnes en rekke restauranter og butikker i nærheten, i tillegg til nesten alle tenkelige fritidsaktivitet. Golf: På komplekset er det et klubbhus som serverer god mat og drikke. Det finnes en rekke lokale golfbaner, inkludert El Paraiso, Los Flamingos, Guadalmina (36 hull), Monte Mayor, El Paraiso (18 hull) og Atalayas (36 hull). Note: Rates are negotiable for stays in excess of 2 weeks. Please note the site does not calculate the correct rate for 3-5 day stays - please ask if you are interested in a short stay and I will quote. Thank you.